Campbell, Randolph B. Sam Houston and the American Southwest. New York: Harper-Collins, 1993. Campbell, Randolph B. An Empire for Slavery: The Peculiar Institution in Texas, 1821–1865. Baton Rouge: Louisiana State University Press, 1989. Friend, Llerena B. Sam Houston: The Great Designer. Austin: University of Texas Press, 1954. Gambrell, Herbert P. Mirabeau Bonaparte Lamar: Troubadour and Crusader. Dallas: Southwest Press, 1934. Hardin, Stephen L. Texian Iliad: A Military History of the Texas Revolution, 1835–1836. Austin: University of Texas Press, 1994. Lack, Paul D. The Texas Revolutionary Experience: A Political and Social History, 1835–1836. College Station: Texas A&M University Press, 1992. Lowrie, Samuel H. Culture Conflict in Texas, 1821–1835. New York: Columbia University Press, 1932. Nance, Joseph Milton. Attack and Counterattack: The Texas-Mexican Frontier, 1842. Austin: University of Texas Press, 1964. Poyo, Gerald E., ed. Tejano Journey, 1770–1850. Austin: University of Texas Press, 1996. Winders, Bruce. Crisis in the Southwest: The United States, Mexico, and the Struggle over Texas. Wilmington, DE: Scholarly Resources, 2002. 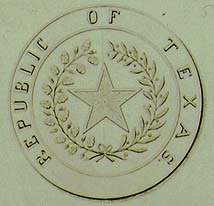 Joint Resolution for Annexing Texas to the United States, Approved March 1, 1845 Texas State Library & Archives Commission.